Continuously pursuing strategies for advancing the human condition in areas of: mind, body and spirit. Taking a holistic approach to mind and body so we can reach your goals. I believe in you, let’s do this together. Taking the first step in fitness can feel overwhelming, but the good news is, I’ve been there and I get it. Let’s schedule a call today to see if working with me can help you change your life. Click below to schedule a free consultation call. My mission is to use my talent, experience, and personal story of losing 145 pounds in 2010 to inspire as many people as I can, while providing them tools to live their best lives. If you are looking for strategies to reduce stress, eat, sleep and move better, or support and accountability to achieve dietary, behavioral, and weight loss goals - I am here for you. I am abundantly passionate about teaching people to implement evidence-based strategies and tools that can have a profound and lasting impact toward creating healthy and sustainable patterns of behavior. Using Meditation and Mindfulness to teach clients to approach their thoughts with kindness, or as an impartial observer. Teaching quick, simple, and effective strategies to empower you with food as fuel to nourish your body, rather than rules that restrict and deprive. Promoting stability, strength and mobility through customized fitness programs tailored to your goals. I teach tools for promoting empowered independence, healthy cooperation, and mental resilience through adversity. Ready to start or looking to get more information? Schedule a call with Tony to get your free consultation and see what this is all about. -Nutrition tips delivered weekly via email. -2 or 3 weekly personal training sessions in the comfort of your own home, using facetime, skype or google hangout. -Focus on customizing mindfulness and physical fitness training to your goals. -Lose weight and inches, drop body fat percentage, and add lean muscle tissue. -Get off your medications and start living again! -Strength training, hiking, yoga, meditation, biking, kayaking, paddleboarding, interval training and more! Want to find out more about the services I offer for Mindful Fitness? Contact me below! 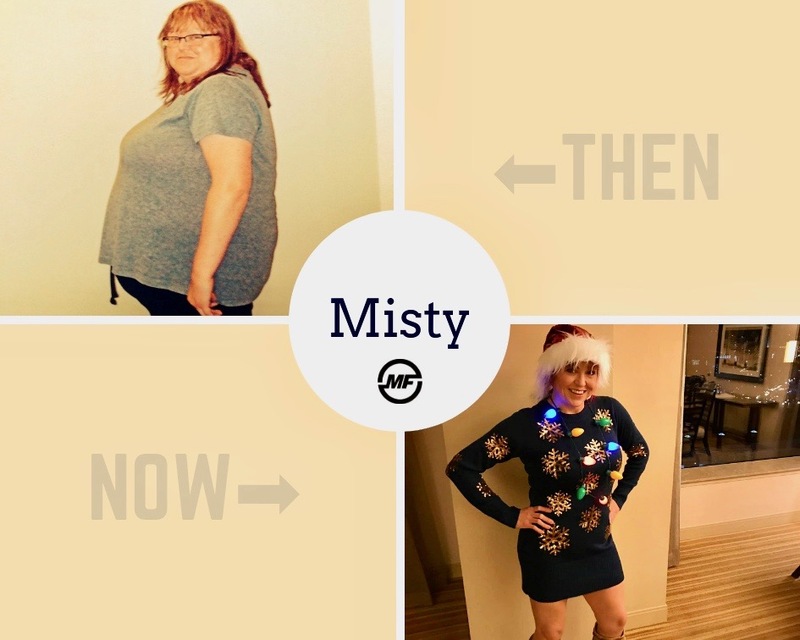 Misty has lost 150+ pounds and kept it off over three years of working with Tony. Anthony Johnson is a Certified Personal Trainer, Educator, Public Speaker, and Motivational Coach. In 2010 he accomplished a tremendous life goal of losing 100+ pounds in a calendar year. He now wakes up every day with the inspired intention of helping as many people cultivate and execute the lifestyle changes he did. In 2016 he left his career as a professor and classroom educator to teach people how to live their best lives. He still applies his passion for teaching in new contexts, as a health and behavior coach, organizational and health communication consultant, and guest speaker. His specialties include: Weight-loss, Functional Mobility and Stability Training, Sports Conditioning, Kickboxing, Obstacle Course Race Training, and he is an avid Yogi and practices daily meditation. At Mindful and Fit Coaching, we offer coached personal training geared toward advancing the human condition in all aspects of mind, body, and spirit. We are not your average fitness bootcamp. Each session includes guided meditation and a stretching and reflection cool-down time at the end. Each client is encouraged to journal each day with the goal of identifying your negative, self-limiting beliefs – working with a coach who will offer strategies for systematically reframing those into positive, life-affirming beliefs. In addition, you will receive individualized instruction from one of the nation’s elite fitness trainers, Tony Johnson, who transformed his own life in 2010 and has since helped 1,000’s of people do the same. Remind yourself that you are a warrior. And warriors don’t give up.